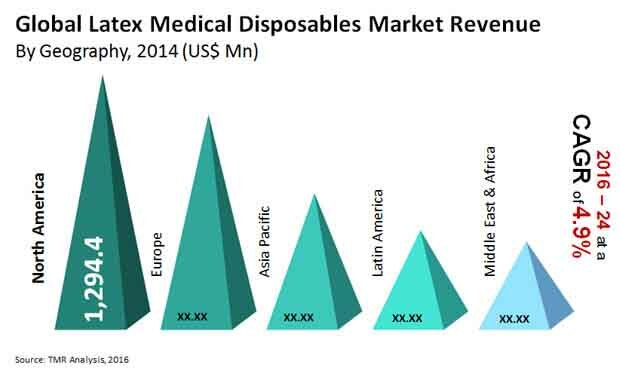 Leading five companies held 60.0% share in 2015 that made the global latex medical disposables market fragmented. These companies were C.R. Bard, Top Glove Corporation, Hartalega Holdings Bhd, Ansell, and B. Braun Melsungen used advanced technology and launched new products. Apart from these companies, various regional players are also making efforts in to maintain their position in the market. Increasing investment in research and development activities and offering discounts on bulk purchases are strategies used by both global and regional players. Another significant point is that entry of new players has relatively lower threat as compared to threat caused by substitute goods. Presence of substitute goods hamper players profit generation and scope of growth of key products. According to the statistical information presented in the Transparency Market Research report, the global latex medical disposable market is estimated to generate US$6.4 bn by the end of 2024. In 2015, the market earned US$4.1 bn. this figure is attainable, if the market rises at 4.9% CAGR between 2016 and 2024. Among the various products, used in the global latex medical disposable market demand for latex gloves is high which is fueling growth in this market. The latex gloves segment held 60.4% share in the overall market in 2015 and is likely to dominate the market over the forecast period. For protecting hands of healthcare providers and patients, latex gloves are widely used. With the respect to geography, North America leads the market and Europe is giving close competition to get a leading position in the global latex medical disposable market. Increasing health awareness and spreading contagious diseases in North America are the key factors driving demand in this market. Moreover, Asia Pacific latex medical disposable marker is also expected to rise at a steady growth rate in the coming years. Technological advancements taking place in the healthcare sector is the key factor driving growth in the global latex medical disposables market. Key market participants are investing in innovative technologies and developing new products that will help in reducing infections and risks this will helps in expanding demand in this market. For example, BARDEX I.C., which is an infection control latex Foley catheter, helps in minimizing risks associated with catheter urinary tract infections. The technologically advanced catheters dramatically reduces bacterial adherence and decreases the formation of biofilm. Adding further, increasing latex allergy across the globe has also boosted growth in the global latex medical disposables market. Increasing number of cases where people are suffering from latex allergy is likely to challenge growth in the global latex medical disposable market. According to Becton, Dickinson and Company (leading medical technology company) data, there are about 17 million people dealing with latex allergy in the United States. Owing to this fact, various healthcare providers are using non-latex products that might limit growth in this market. Another restraining factor is increasing competition among players that leads in reducing prices of these products that overall reduce profits of the players. Thus, lower revenues might hamper growth in the global latex medical disposable market. The study presented here is based on a report by Transparency Market Research (TMR) titled “Latex Medical Disposables Market (Product Type - Latex Gloves, Latex Foley Catheters, Latex Probe Covers, and Urine Bags); End User - Hospitals, Clinics, Ambulatory Surgical Centers, Clinics, and Diagnostic Centers) - Global Industry Analysis, Size, Share, Growth, Trends, and Forecast 2016 - 2024”.